Today’s ride: The Delaware Double Cross starts in Middleton DE and crosses the state of Delaware twice. It’s a Metric Century held by the White Clay Bicycle Club which does a fantastic job organizing it, and it’s a flat ride that tends to be hot. There are two thirty mile loops to make up the Metric Century Distance, with a rest stop in the middle of each loop and a stop at the starting point midway through the ride. 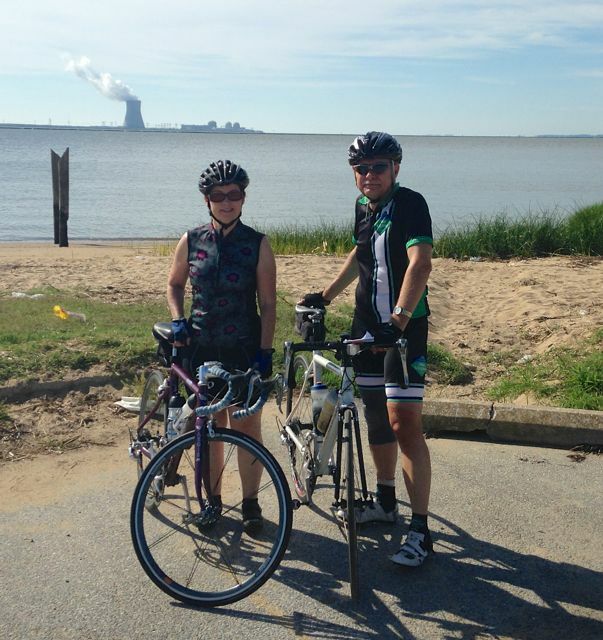 The ride crosses through the north end of Delaware, and the marshes near the Delaware Bay, and most of the course is open and easy to ride, but that means that much of the ride is not shaded. The Experience: Today the weather was on our side. This can be a very hot ride, but there wasn’t the heat of previous years. We had wind to contend with, but that is expected on the eastern shore, and sometimes it will work with you. Ron Tripp, Rita Spence and I headed out of Middleton in the cool of the morning. We rode up behind a large slow pack of riders as we waited at a light to cross a highway. It turned green as we arrived, and Ron decided to sprint around the pack. I took his wheel and Rita took mine. Though we were on open road, some other riders had sprinted around them as well, and they locked on to our wheels and started talking loudly among themselves. I reacted in the only way I could – I lifted the pace. The point was either to make them think about breathing instead of talking, or we would drop them, which would have the same effect. With a favorable wind, we moved smoothly down the road into Port Penn and the first rest stop, while enjoying the relative quiet. We set off to cross Delaware again and made it back to Middleton in good form. Ron and I took turns at the front pedaling into the wind – and today the wind was strong enough to make us work hard. It wasn’t bad as a crosswind, but riding into it was tough. The lack of heat was a blessing however, and we rode strong Our pace was very steady, and the scenery at the north end of Delaware was very pleasant. After the ride we headed for the Bay Bridge hoping to beat the traffic coming back from the beaches. 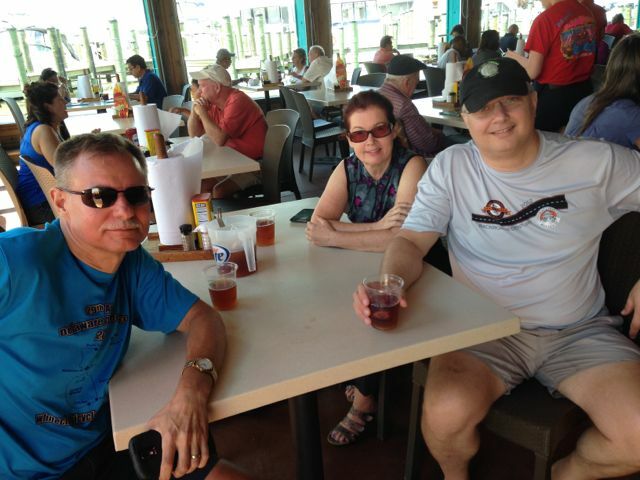 We had no trouble, and we stopped at the Crab Deck on Kent island for lunch. It was a great end to a nice day of riding. Selections from my mental iPod during the ride: “Once Upon A Time” by The Pogues, and “Soho Square” by Kirsty MacColl. Stats: 60.35 Miles ridden. Despite the wind, we rode well. The lack of heat made this metric century easier than in previous years. 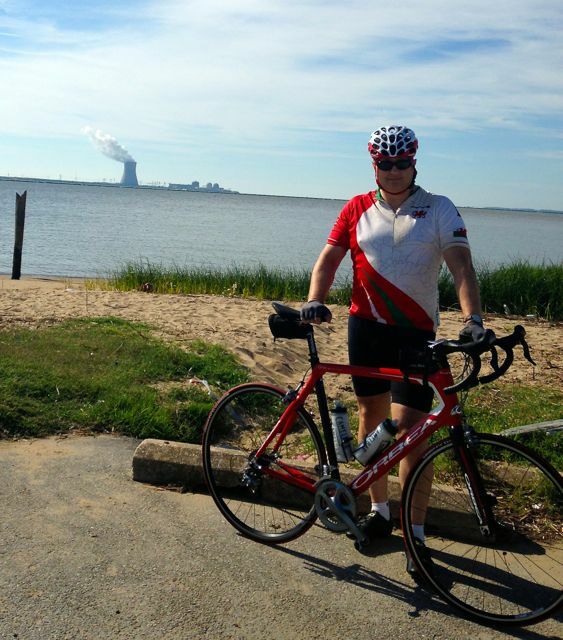 Augustine Beach on the Delaware River, with a Nuclear Power Plant as a backdrop. Rita and Ron, with the same backdrop! 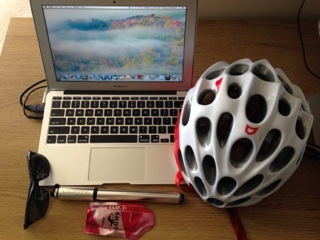 This entry was posted in Cycling on July 6, 2014 by kitefencer.